Cambodia’s opposition party, the CNRP, was planning to protest for three days against the allegedly dodgy results of the recent national election and the government was well prepared for… well, no one’s really sure what they doing blocking off roads all over town. A police officer, Pol Sam Oun, stationed at a roadblock on the corner of Norodom Boulevard and Street 294, told the Cambodia Daily that the measures were to facilitate access for demonstrators attending the protests. “We blocked the road to stop the protesters going onto different streets. If we open all of the roads, it would be anarchy — that’s why we do this, it’s to help get them to Freedom Park and so there are no traffic jams,” he said. Of course the country’s most important assets were well protected. What was clear was that the barriers were proving a major hassle for everyone, not just the protestors. Meanwhile, this tweet turned out to be particularly prescient. At least one tweeter was less than impressed not so much with the ubiquity of the “security measures” but their quality. Early in the day Cambodia Daily editor-in-chief Kevin Doyle was tagging along with CNRP president Sam Rainsy who was marching toward the sanctioned protest site with an entourage of thousands. The government and municipal council had given permission for the opposition to hold their protest at Freedom Park, a long, narrow stretch of open land cut in half by Norodom Boulevard and located a block and half south of Wat Phnom, a block west of the northern end of the Riverside strip and about 2km north-west of the Royal Palace. Many protestors had arrived the day before and by about 10am there were already thousands of men, women and children in attendance. A festival-like atmosphere engulfed the park and its surrounding streets for most of the morning with the crowd, decked out in stickers and hats and bearing signs such as “Where is my vote?” and “Long live democracy”, joyously dancing following the leaders’ speeches. …and the Cambodia Daily reported the crowd swelled to as many as 30,000 people after Rainsy and CNRP deputy president Kem Sokha arrived. Even after a big morning of walking, Rainsy seemed to still be in a marching mood as just before noon off he chuffed in the direction of the Royal Palace to do some praying. Rainsy and Sokha walked down Riverside with thousands of supporters in tow and then on arrival at Wat Ounalom – near the comprehensively-defended Royal Palace – neatly slipped through a razor wire barrier to get to the temple. Doyle was on the scene there too. Some enthusiastic supporters started removing the barriers Sokha and Rainsy and gone through, as the police readied their smoke canister launchers. Rainsy addressed the crowd once again and seemed to calm everything down and they headed back in the direction of the Freedom Park. Meanwhile, the roadblocks were once again causing disruption. The Cambodia Daily later quoted Kantha Bopha hospital director Denis Laurent as saying the ambulance had been transporting sick children between two Kantha Bopha hospitals and been forced to turn back. Military police spokesman Kheng Tito said that ambulances were “not supposed to be” in that area and denied that police patrolling barricades would have blocked the ambulance from passing. And here are some really great photos by the Ruom multimedia collective of the marches and the main rally. Back at Wat Ounalom on the Riverside tensions continued to simmer and about 4pm the first reports started coming through of trouble. At Sisowath Quay, police used water cannons and unloaded volleys of smoke canisters on approximately 100 protesters – some of whom had forcibly removed police barricades and dragged razor wire fences into the Tonle Sap river. The protesters responded to the use of water cannons by hurling rocks, shoes and pieces of metal from the destroyed barricades at police, which led to about a dozen smoke canisters being fired by the authorities. One man somehow got caught in the razor wire while being blasted with the water cannon (photos here). In the aftermath, a rowdy crowd remained facing-off with a line of soldiers beyond the remains of the razor wire, which was merely symbolic at that point (bystanders and media were wandering around it as they pleased). Some, including a young monk, were trying their best to defuse the situation. However others, including a shirtless man with a bandana over his face and carrying a long steel pole, were spoiling for a fight. It wasn’t clear whether CPP plants or just idiots but they weren’t helping the CNRP’s attempts to keep the protests peaceful. Behind the line of riot police were hundreds more troops, with a few firetrucks (obviously not there to put out fires). Officers from the UN Office of the High Commissioner for Human Rights made a dramatic public entrance into the post-election fray on Sunday afternoon when a white SUV from their office pulled up in front of police barricades at Sisowath Quay to wild applause after authorities clashed with demonstrators. “OHCHR-Cambodia was on the scene and spoke with the Police Commissioner about ways to prevent further eruptions of violence,” country representative Wan-Hea Lee said via email. They then went off to have a quiet chat with the military chiefs at one of the nearby drinking establishments. Serious. About 5.30pm Rainsy also came back to help defuse the situation. Rainsy comes thru barricade to talk to chief cop. I am told that Rainsy told the crowd not to fight the police. That after talking with the chief of police. As the 6pm deadline for protestors to leave Freedom Park approached the mood remained buoyant and peaceful as about 1,000 protestors settled in for the night while others headed home. Things seemed to settle down after that and the #electionsKH Twitter hashtag was relatively quiet for a few hours. But just before 9pm tweets started coming through about trouble not at Freedom Park but at Kbal Thnol, in the south of the city. Of course, Cambodia Daily editor-in-chief Kevin Doyle was in amongst it. Military Police spokesman Kheng Tito told the the Phnom Penh Post the clash began about 8pm when “opportunistic” protesters started tearing down barriers. In response, military police threw a smoke bomb, which further incited tensions. Protesters began cursing and throwing rocks at the police, who then fired AK-47s into the air at least half a dozen times. The post said the police showed “immense brutality”, tasering and kicking in the head already restrained men. There was briefly some uncertainty about the cause of death, but it was soon confirmed that the man had been shot in the head. A mob of people refused to let the police remove the body for hours. About 12.45am UN officers were allowed to take the corpse away to the Khmer-Soviet Friendship hospital to be autopsied. Thomas Cristofoletti of the Ruom collective took these shots of the nighttime violence. According to the Phnom Penh Post, Mao Sok Chan was on his way to help a friend sell newspapers at west of the bridge when he was killed. It seems he was just in the wrong place at the wrong time. His brother told the Post Chan had never been involved in a protest before. As I watched, authorities began grouping under the bridge. Led by an elite unit clad in black body armour, authorities hurriedly crossed the bridge and began pursuing a group of demonstrators taking shelter near the ramshackle Char Ampov market. Cattle prods and electrified riot shields crackled in the light drizzle. From less than 50 metres away, I witnessed the thump and flash of smoke grenades, followed by the clatter of automatic rifle fire. When the demonstrators dispersed, screaming under the barrage, they were pursued through the narrow alleyways surrounding the market. The Phnom Penh Post put out another great video about the two clashes with some amazing footage of both. For a bit of insight about what it was like at Freedom Park on the Sunday night a read of this report by the Phnom Penh Post’s Shane Worrell who spent the night there. Monday morning dawned with the horrible events of the night before fresh in everyone’s mind. At least nine people had been injured in the clashes – including eight with bullet wounds – and one man had been killed. The Cambodia Daily reported that six men arrested on Sunday night appeared in court over the clashes but it was unclear if they were charged with any offences. Amnesty International considers that the Cambodian security forces’ use of force on 15 September 2013, which led to the death of one man, was excessive and appears to have violated Cambodia’s international legal obligations to respect human rights, including the right to life and physical integrity. These rights are protected in Cambodia’s Constitution and in the International Covenant on Civil and Political Rights (ICCPR),to which Cambodia is a state party. U.S. Embassy spokesman John Simmons told to the Cambodia Daily that the Cambodian government was looking into the death but said the investigation needed to be “full and transparent”. The same article quoted a statement from European Union Ambassador Jean-Francois Cautain that expressed the EU’s concern and sadness about the violent clashes that resulted in the death and injuries. “We call on all sides to exercise restraint and avoid violence. In particular, we call on the authorities to use proportionate means to manage protests, and call on demonstrators to conduct their protests in a lawful and peaceful manner,” he said. The big question though was whether Mao Sok Chan’s death would prove the spark that ignited city-wide violence. However, a meeting pre-arranged meeting between the CNRP and CPP leadership provided the opportunity for a circuit-breaker. CNRP leaders Sam Rainsy and Kem Sokha, went into the meeting with Prime Minister Hun Sen about 9am on Monday demanding reforms to the National Election Committee, a CNRP television station and a new national voter registry. After Sunday’s dramatic events hopes were high there could be a breakthrough. As the hours ticked by the waiting media did their best to entertain themselves. Finally, about five hours later, the leaders emerged, apparently ebullient. But it seemed little had been achieved. Voice of America reported that the starting point of negotiations had been a letter released by King Norodom Sihamoni calling on both sides to ensure peace. Speaking at Parliament on Monday, opposition spokesman Yim Sovann said the king’s request had formed the first of three items agreed to between the ruling Cambodian People’s Party, or CPP, and the opposition Cambodia National Rescue Party, or CNRP. “The first point is to avoid the violence – we have to respect the royal letter of the king dated today, that asked both the CNRP and the CPP to avoid as much as possible the violence. Our demonstration must be peaceful and also the government must be very patient not to use force or weapons against the demonstrators,” Yim said. Exactly what was meant by a “mechanism to reform the electoral process” was unclear. Still, according to the Cambodia Daily, CNRP spokesman Yim Sovann received rapturous applause when he delivered news of the results to an estimated 20,000 people at Freedom Park. “We received a big success and this is the solution that our people have demanded during the past two decades,” Mr. Sovann said, referring to the CPP’s agreement to form a joint mechanism to reform the National Election Committee and electoral laws. However, Rainsy told the crowd the CNRP would continue to protest and boycott the formation of the National Assembly until the government conceded to demands for an independent investigation into the election results. He then called for a minute’s silence in memory of Mao Sok Chan. Concerned about a lack of specificity in the agreements, political analyst Kem Ley told the Phnom Penh Post that he was unsure whether the accord would be significant “unless the opposition party designs details for the reform of the NEC, and designs the order for the investigation of the irregularities”. Meanwhile, an analysis piece by the Cambodia Daily said the two gulf between the parties remained huge. As for electoral reform, [CNRP spokesman Yim] Sovann said the opposition would be pressing for changes to the composition of the NEC, which is stacked with former CPP officials. Current election laws give the CPP-controlled Interior Ministry complete control in selecting candidates for the electoral committee and the CPP-dominated Parliament the power to approve them. Highlighting just how far apart the two parties were even on this, Mr. Sokhon’s idea of NEC reform involved mulling the possibility of changing the current dates of national elections, which are held every five years, and voter registration to avoid the rainy season. Mao Chan’s funeral was held on Tuesday morning. According to the Cambodia Daily, Meanchey district deputy governor By Nay gave about $2,500 to Mao Chan’s widow Chiv Sokvy. King Norodom Sihamoni also gave eight of the shooting victims from Sunday night $1,000 each. At Freedom Park, the proceedings were disturbed just before noon when a monk threatened to immolate himself in protest at the alleged election fraud. Demonstrators at Freedom Park were encouraged to speak to the crowd, and the monk stood up on the stage, spoke passionately about the unfairness of the vote and the suffering of the people, and then pulled out a bottle of gasoline. He was starting to pour it on himself when other monks and demonstrators on the stage jumped in to restrain him before he could set himself alight. Cambodia National Rescue Party politician Ho Vann, who witnessed the incident, identified the monk as Seng Sina, 35, from the southern province of Takeo. He added that Seng Sina said he wanted to commit suicide in order to push for the election investigation committee to be set up and for justice for Cambodia’s people. He was taken away by other monks who were looking after him, Ho Vann said. Around the same time at the National Assembly, the CNRP and CPP leadership met once again but this time with even less to announce afterward. “We’ve come closer and closer to a solution. We expressed our opinions, we told each other about our objective to reform national institutions,” said Yim Sovann, spokesman for the opposition Cambodia National Rescue Party (CNRP) told Reuters. “But there are so many problems that have been around for so long, so we need time to discuss them,” he added. “We have come closer to finding a solution to the problem facing the country,” opposition spokesman Yim Sovann told reporters after the latest talks. Ruling party spokesman Prak Sokhon said the two sides were “on the path to find a joint resolution”. Elsewhere in the city, people were putting the barriers that had proved so problematic to good use. For some nice photos of day three at Freedom Park check John Vink’s photoblog. 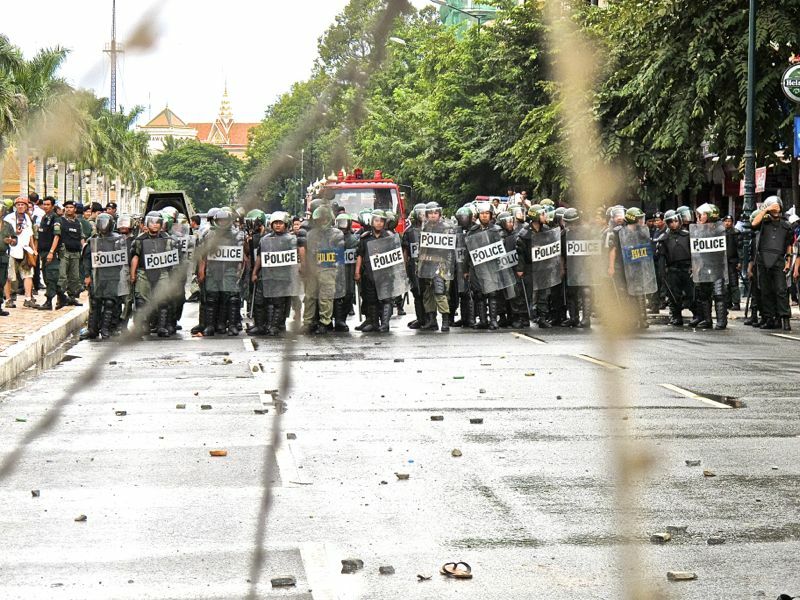 The three-day protest finally finished about 5pm on Tuesday, the Phnom Penh Post reported. As Rainsy and Sokha left the stage before 5pm, wading through mobs of ardent supporters, thousands began pouring from Freedom Park. Families who trekked hundreds of kilometres rolled up sleeping mats and accepted a final meal from volunteers. As a truck carrying at least 50 supporters back home rumbled past Freedom Park, fellow demonstrations screamed farewell. An emcee took the stage and urged the remaining thousand or so to clear out, as dozens of youth began sweeping the square clean. But long after the party’s clear-out deadline of 6pm, hundreds remained in Freedom Park, uneager to depart. However on Twitter some questioned whether the rally had been a success. According to the Phnom Penh Post the police on Wednesday had yet to begin an investigation into the circumstances surrounding Mao Sok Chan’s death, with CPP lawmaker Cheam Yeap citing the ongoing negotiations between the two parties as the reason. Yeap said an investigation would begin in the next few days. Meanwhile, King Norodom Sihamoni has announced that the opening day of the National Assembly should take place on Monday but according to the Cambodia Daily the CNRP won’t be there unless the CPP caves to its demands. If the opening of the National Assembly goes ahead without the CNRP, the party plans to hold further, even larger, protests.